November 29, 2016, 5:53 p.m. The 12th annual British Curry Awards – or the Curry Oscars as they are more endearingly known – took place on Monday. Two centuries after the first curry house opened in this country, the cuisine has been wholeheartedly embraced by Britons, as evidenced by David Cameron, Theresa May and Boris Johnson’s presence at the Awards in previous years. 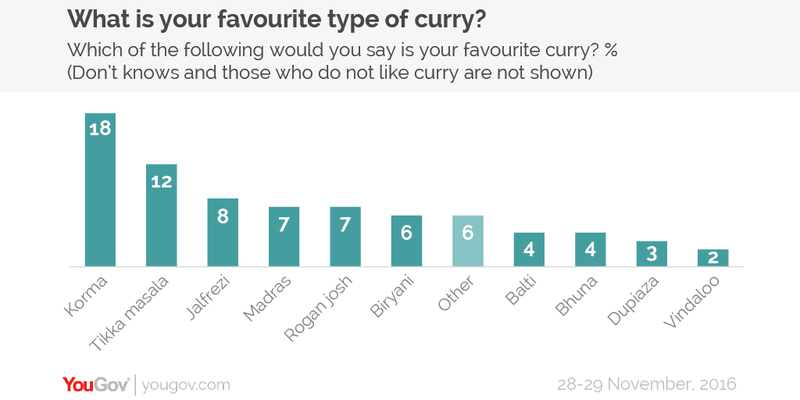 New YouGov research now shows that the humble korma is Britain’s most popular curry, with approaching one in five (18%) of Brits saying it is their favourite. 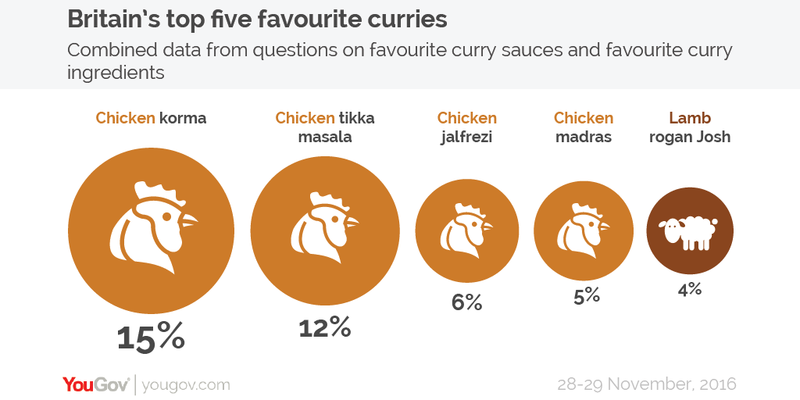 Britain’s own contribution to the curry world – the tikka masala – comes in second with 12%. The milder curries&apos; presence at the top of the charts is down to their particular popularity among two demographic groups: women and younger people. Women are much more likely to opt for a mild curry than men. Korma is the preferred curry of nearly a quarter (23%) of women, a full 10 percentage points more than men. On the spice scale, twice as many men as women say that one of the three curries we have classified as ‘hot’ – the jalfrezi, the madras and the vindaloo – is their favourite. Young people are also noticeably steering clear of hotter curries. Just 1% of 18-24 year olds say that a madras is their favourite curry, as well as a statistical 0% for jalfrezis and vindaloos. Instead, they are much more likely to opt for a korma (32%) or a tikka masala (18%) than older age groups. Chicken is by far the main ingredient people most want in their curry – almost three in five (59%) say that it is their favourite, compared to just one in five (20%) who choose lamb. Combining the figures for favourite curry sauce and favourite main ingredient reveals the single most popular curry in Britain: the chicken korma, with 15% choosing this precise dish. The chicken tikka masala comes in close behind, on 12%. The top five curry combinations are rounded off by chicken jalfrezi (6%), chicken balti (5%) and lamb rogan josh (4%, and the only curry where lamb was more popular than chicken). Moving on to side dishes, pilau rice is by far the preferred rice to accompany a curry. With more than half of people (55%) saying that it is their favourite rice to have with a curry, it is more than three times more popular than the next type (plain, 18%). The public are much more divided when it comes to their favourite naan bread. Three in ten prefer garlic naan (31%) followed by plain naan at 25% and peshwari naan at 22%. The keema naan is somewhat left behind, being the choice of just one in ten (11%).